When it comes to HVAC companies in Cincinnati, there are more than a few different ways people tend to search for the right kind of provider. There’s the old fashioned way, of course, which might involve flipping through the phone book and giving a few different local HVAC providers a call to find out their rates, services, and any other pertinent information they might need to in order to make a decision. There’s another way that the kids are using these days — and it’s called the internet. We kid, of course, since obviously pretty much everyone in Ohio and indeed the entire country uses the internet numerous times per day. There’s no escaping it, either. It’s become an essential part of life, whether you need an instant-encyclopedia to tell you the 2nd longest river in the world (the Amazon) or you’d like to find reviews for the top HVAC companies in Cincinnati. Now that we’ve successfully described to our readers some of the untold wonders of the internet (namely that it can be used to find reliable HVAC service), we’d like to tell you why you should consider us among your options. First and foremost, we at ElectricMasters understand that you have choices when it comes to choosing an HVAC repair service provider or a local electrician (we are electricians too, if you didn’t know). We also understand that it can be difficult to parse through the myriad listings of companies trying to earn your business out there. 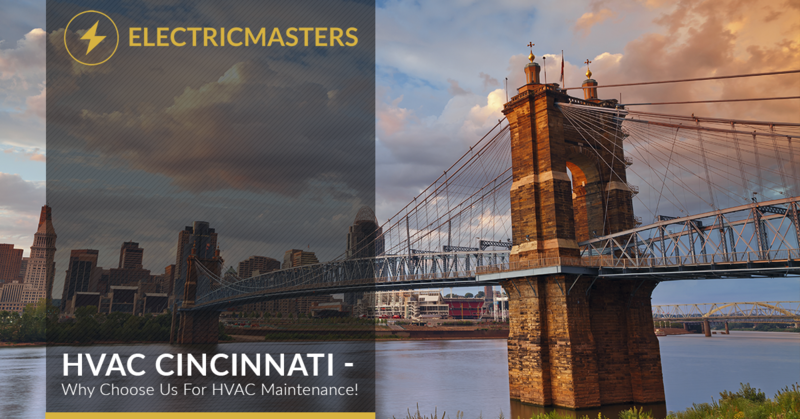 Hence, in today’s post, we’d like to highlight who we are at ElectricMasters, in addition to telling you what we offer and why you should choose us for all of your HVAC Cincinnati needs. Keep reading if you are interested in finding a local HVAC service company worth its salt! For over two decades we’ve been providing Northern Kentucky and Cincinnati with reliable electrical and HVAC services. We have the experience and expertise you are looking for, with a particular attention to detail regarding doing the job right the first time. And, as we mentioned above, we are fully aware that there are plenty of HVAC maintenance companies who are vying for your business in one way or another, but what really sets us apart is that we have a track record of competence and reliability to back up our claims. Not all HVAC companies are created equal, and in the same way, not all companies have an A+ rating at the Better Business Bureau. Since 1999, we’ve been accredited with the BBB. Not only that, but we have a wide range of experience when it comes to heating, cooling, and electrical issues. Given our considerable experience as electricians, we are able to take a holistic picture of your home or place of business so we can more effectively diagnose and troubleshoot any issues. You won’t find many other businesses out there who have as wide of a range of expertise like we do at ElectricMasters. Now that you’ve gotten a feel for what kind of service we provide, we’d like to briefly explain the different HVAC services we provide in Cincinnati and Northern Kentucky. Commercial HVAC Services – For all of the business owners out there, we want you to know that we are able to affordably equip you with the heating and cooling services you need to ensure your employees and patrons are comfortable while they are in your place of business. It’s no secret that having an HVAC system you can count on is essential for every kind of business, so whether you are in need of HVAC replacement, repair, or maintenance, we can help you out with reasonable fees! Residential HVAC Services – If having a comfortable temperature and airflow is critical for your commercial establishment, how much more important is it to have the same level of comfort in your home? Your home is where you can unwind and spend time with those who are closest to you. And now that winter has well and truly come, ensuring your family’s comfort throughout the day and night is certainly worth your attention. So whether you are in need of preventive maintenance to make sure you are covered for the cold season or you are in need of a brand new HVAC unit to replace an old one, we’ve got you covered!